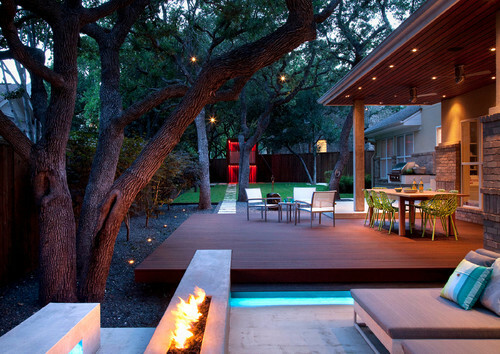 Landscaping around deck areas can be tricky. Do you have enough space? Won’t it obstruct the view? Do you have enough time to maintain it? These are all questions I asked myself before I decided on the perfect landscaping style. 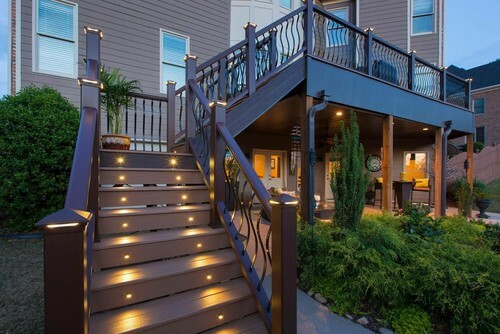 Coming up with ideas for landscaping around decks can be difficult, I know. I spent forever researching and, at the end, I came up with this wide and varied list. I know what I went through, racking my brain the whole time, so I’m going to share that list with you today. You have a big yard and a big deck, so you don’t need to worry about trying to make it look bigger. The problem is, you need to make your deck seem less empty! 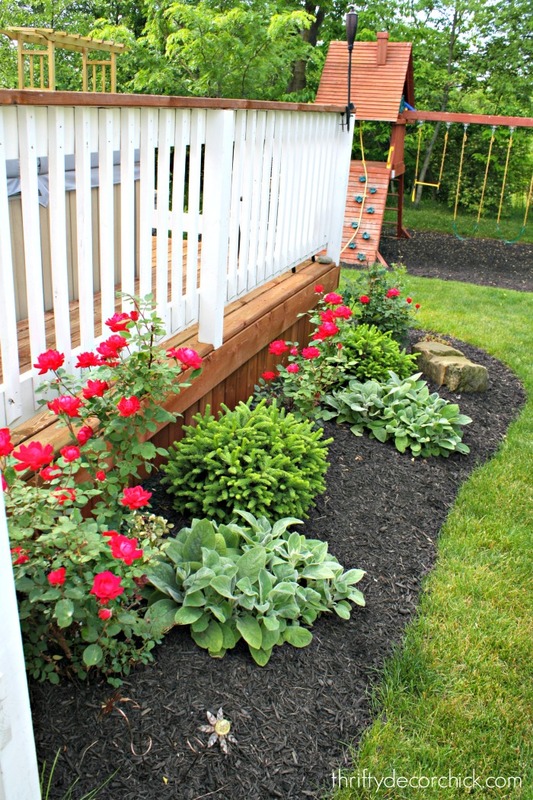 Pile some huge rose bushes at the corners of your deck. You want the bigger landscaping plants (the flashier and bushier they are, the better). Pepper in some hostas and a couple of potted petunias and you’re done! Time to invite over the neighbors! 2. 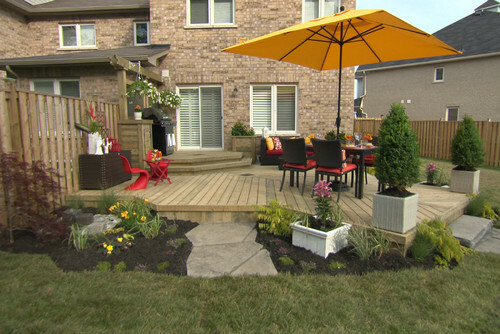 Grow Your Small Deck With Landscaping! 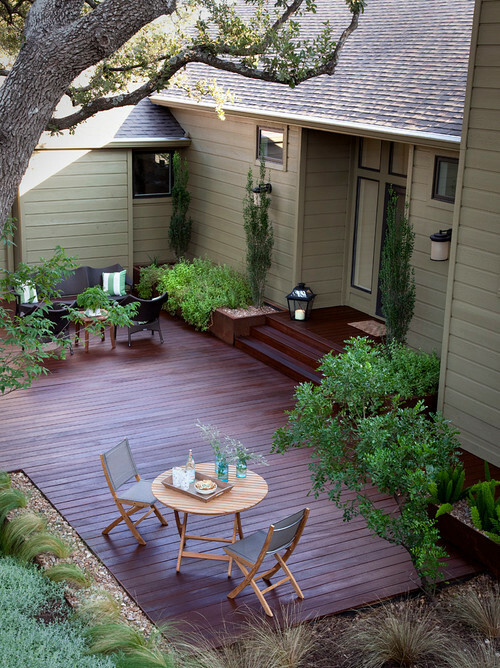 If you have a small deck, landscaping can give it a larger feel. Plant some low growing foliage and flowers, leaving plenty of void space between them. This creates the illusion of a sprawling, open area!You can use larger potted plants to trick the eye into thinking that the deck itself is bigger. All you need to do is place them near the edges and voila! 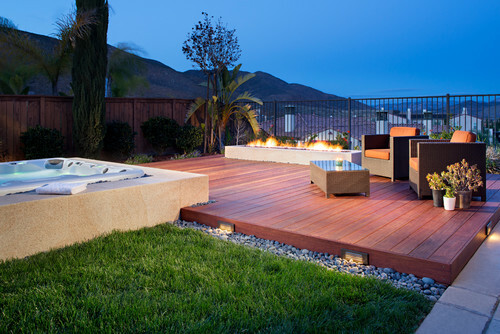 Photo by Fine Decks Inc. 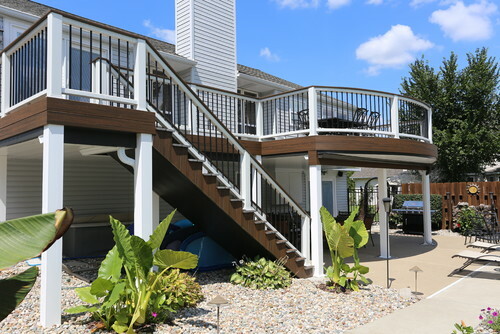 If your deck is little more than a runway, then you might worry about overcrowding the space. Having too much going on around the perimeter can make it look even smaller, after all. An easy way to create the illusion of a larger deck is by using stone filler near the perimeter. Not only does it maximize void space, but it also cuts down on maintenance! 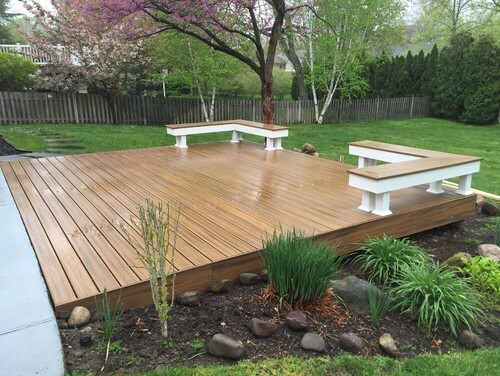 Your deck isn’t small, but it’s so plain! You know some landscaping would improve its look, but nothing quite seems to fit. 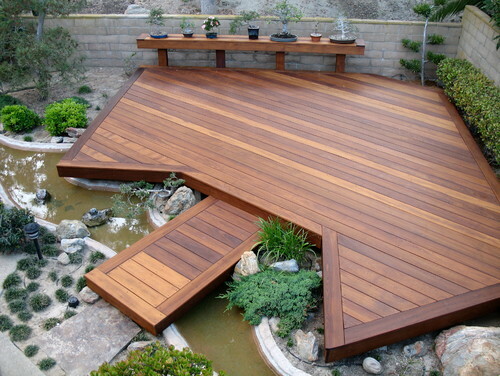 A deck like that calls for a more Eastern style! To create this look, pour small, light-colored pebbles along the perimeter. When you plant ornamental grasses, the light color of the bed will stress any space left between them. Plant an occasional young tree to dissolve a boring, straight boundary! On the other end of the spectrum, you might find that you have too much space and not enough time to maintain it. If that’s the case, then why not aim for a modern, elegant look? Instead of planting flowers or ornamental grasses, leave your garden beds bare. Plant only a row of small-stature trees, such as Blue Star Junipers. Junipers secrete a toxin into the soil that kills nearby plants. This will save you from having to pull weeds! No problem! Even if you only have the tiniest strip available for landscaping, there’s a design that will work for you. If you don’t have the space in width, then why not use your vertical space? There are plenty of cold-hardy tropical plants that grow tall without getting bushy. Use bamboo and elephant ears to transform your deck area into a cabana getaway! This is the perfect opportunity to go with the wide-open spaces look. Even lawn-grade grass can be landscaping if it’s coupled with the right background. If you’ve got a lot going on as far as deck commodities, the simplicity of grass becomes extraordinary. It offers relief from the noise of lawn furniture, the fire pit, the hot tub, and whatever else you’ve got on your deck. 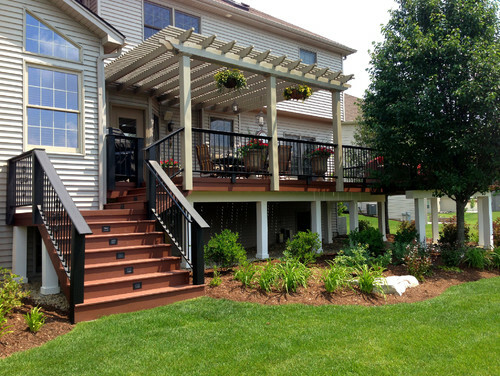 Your deck has wraparound steps and, though you love it, it also makes landscaping a headache. After all, anywhere you decide to try to add a plant, it’s going to look out of place. If you want to add some plant life to your deck, your best bet is to custom build a matching planter that fits the steps. Then, it will look as if it belongs and your landscaping nightmare will end at last. Nothing grows around your deck. The soil is too poor and, to be honest, you don’t have the time to maintain a garden anyway. All you want is to be able to sit out there after work and clear your mind. Well, there are a variety of plants that even your inattention and poor soil will not be able to smite! Try some fescue grass or liriope, both of which are drought resistant. Throw in some stones and a koi pond and you’re all set! 10. A Deck That Rocks! Not feeling all the maintenance that goes into plants, drought resistant or not? Why not create landscaping that transports your guests to a warm, Italian mountainside? Use boulders, as irregular in shape and size as possible, to create the walls the surround your yard. Exchange the conventional pebbles and mulch for rough asphalt and gravel. Garnish with wrought iron furniture and accessories for the ultimate effect. 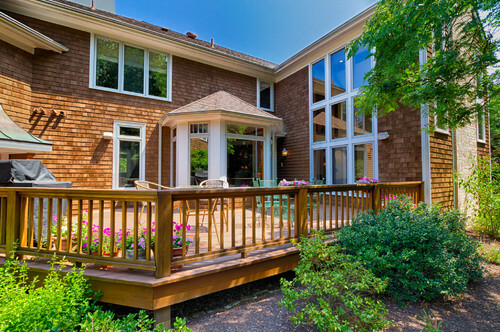 If your deck blends in with your house, then trying to find a way to help it stand out might have you stumped. 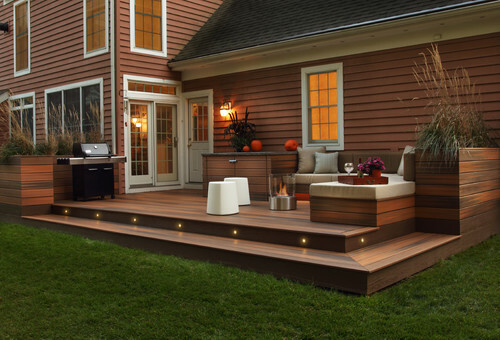 How do you make your inconspicuous deck the focal point? Easy! 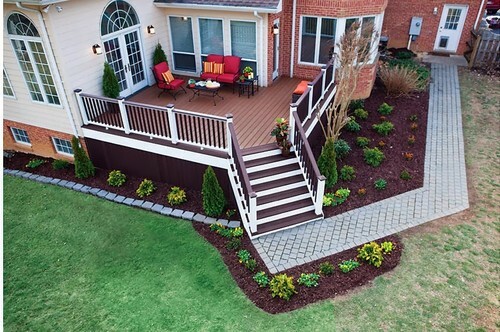 First, plant low growing shrubs and flowers at the nearest point to your deck. You want to keep the view as open as possible here. As you move further away along the house, choose larger and larger foliage. The eyes of visitors will follow the path of least resistance! They’ll see your deck before they notice anything else. You have soil that drains well, little time to plan elaborate landscaping and no time for upkeep. No problem! Choose a few low-maintenance shrubs and place them in a repeating pattern until you fill the bed. Sprinkle in a few hardy primrose bushes between patterns to give it a splash of color! The rose bushes will want some attention every so often. But since the majority of your bed will be more independent shrubbery, you save a lot of time in the garden! 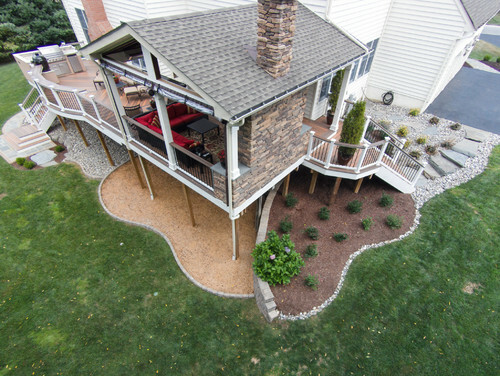 Landscaping is a great way to highlight what you love best about your deck. 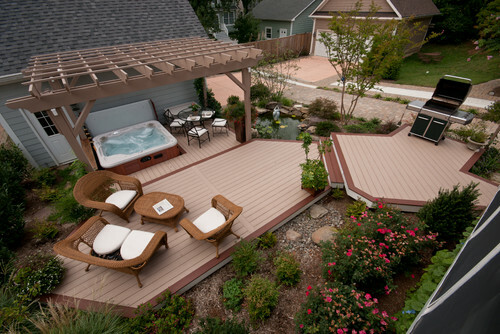 If you have a raised deck with beautiful exposed wood, those are features you want to flaunt! For the most part, you should plant low-growing foliage (like hostas). The good thing about having such a high deck, though, is that you can get away with taller landscaping. You can plant a hydrangea or two without blocking the view or making your deck look short. Your deck is little more than a porch, but you like it that way. It’s cozy and that’s how you want to keep it, but what kind of landscaping can you do that won’t make it look overgrown? Trees are an excellent option! 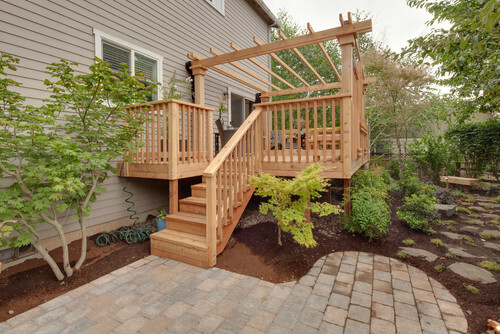 Japanese maples are great for giving a small deck an even tighter feel from the inside. My tip is to leave the view to the yard unobstructed and plant the trees at the corners. If you have a small, elegant deck that is reminiscent of a palace balcony, what should your garden beds grow? 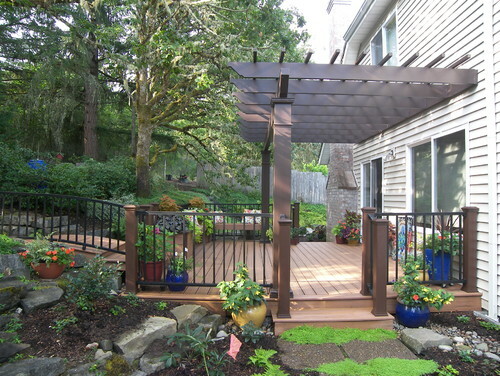 If the style of your deck is more plain and regal, then choose simple and dignified foliage. 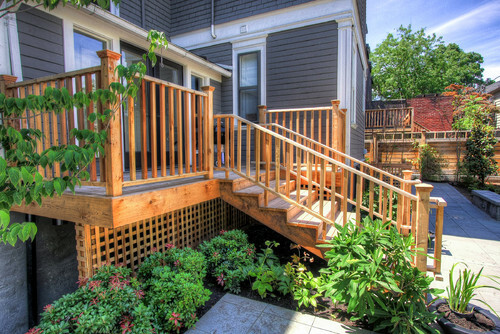 Try planting miniature cedars beside the stairs and at every corner of your deck. Fill the remaining bed with short, quiet flowers to create a balustrade appearance. Hostas are always a nice choice and they need little attention. You have a runway of a deck. It’s so small; you don’t even bother placing a table or chair out there. It is where the grill lives, all by itself. The deck hovers over an even tinier strip of the garden bed. How do you go about landscaping that? The problem you’ll run into is that the garden bed gets extra shade. Choose low-growing plants that want little to no direct sun and you’ll be fine. Select bushy, showy specimens that fill every cranny of the space. The fuller it looks, the less attention there is on your deck. 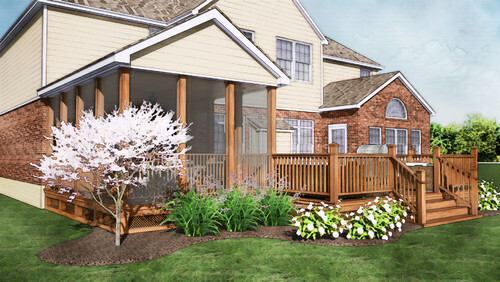 The subdued, earth tones of your deck will not accept anything too loud in its garden beds. The perfect complement to the gray, brown, beige, or sage green of your deck is modest shrubbery. Any dwarf or globe evergreen shrub would be a nice addition to your deck’s border garden. Cedar is good for a touch of bright color if you’d like to liven it up a bit. And these evergreens are low-maintenance and keep their color year round! What kind of landscaping goes with a futuristic deck? What kind of plant pairs well with metal and glass? It’s a trick question. Your deck is carrying itself in this. The landscaping you do for this kind of modern design should pale in comparison to the design. Choose small, mutable shrubs and flowers. You want to select plants that you almost want visitors to overlook. The landscaping you do is only to fill the space and give it a border. The real focus is your gorgeous deck! 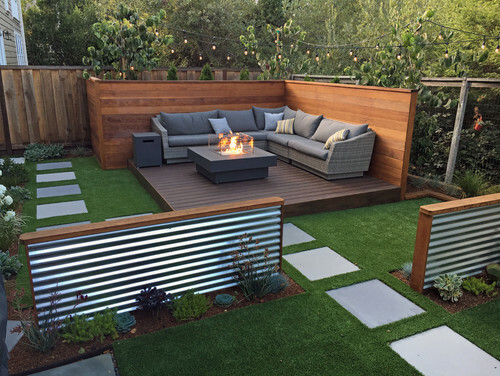 Surround your deck with fescue, European beachgrass, or pampas for a tropical vibe. These wispy plants give your deck an airy, windblown appearance. As you lounge in your chaise, fruity drink in hand, you’ll find it easy to imagine yourself seaside! Red verbena is a nice ground cover that fits the beach scene. Scatter in some succulents, like agave, and your tableau is complete! Spruce up a spacious, uninterrupted deck with a few potted beauties. Petunias and impatiens are a nice domestic touch to a suburban home. Line only the outer edges to preserve the open feel of the deck. The border gardens should run in a similar vein. A few boxwood hedges is all you need to complete the look. And the good news is they are pretty low maintenance! Low maintenance? You don’t even have enough time to water a cactus once a year – or however long it is that they can go without water. Isn’t there some kind of landscaping you can do that never needs you out there? 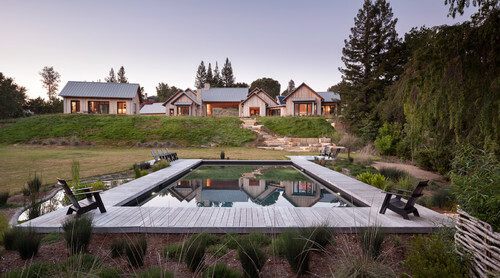 Photo by Meadowview Construction Inc. If you have a lot of room and it won’t make your yard look crowded, consider building a planter at the edge of your deck. Build it up to about chest height and use it to showcase an ornamental tree of your choice. This does a lot more for the personality of your deck than you’d think. It gives the impression of a larger-than-life potted plant, which is sure to draw the eye! A pond, even a tiny one, is always a nice landscaping idea. There’s something about a babbling fountain that sets people at ease almost at once. And, if you’re placing it near a pool deck, it gives them a more immersive experience. All you need are some large, smooth stones to build up the edges of the pond. Then, plant a few clusters of zebra grass in the rocky embankments to give it a more authentic vibe. As a finishing touch, toss in some water lilies! If your pool gets minimal shade, you might want to go with a hotter look than a temperate pond. Model your deck after the scrub forests of California and Nevada by filling the beds with stones. Aim for light, warm colors. Once you’ve got the base, top it off with a few evergreen shrubs and some fountain grass. You could always tuck in some crimson pygmy barberry for a touch of color that doesn’t overwhelm. You have an in-ground pool and your deck is no more than a runway circling its border. 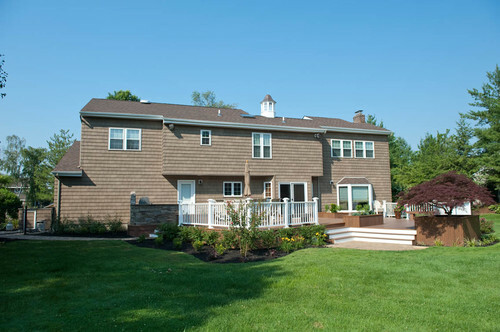 You love the simplicity of it, the way you can see across the entire yard even while you’re in the pool. My advice is to keep your landscaping as sparse and short as possible. All you need are a few dwarf ornamental kinds of grass. If you’re feeling inventive, install a small pond right off the side of your deck. It’s redundant, but that’s what makes it so interesting. It looks as if the pool is overflowing! 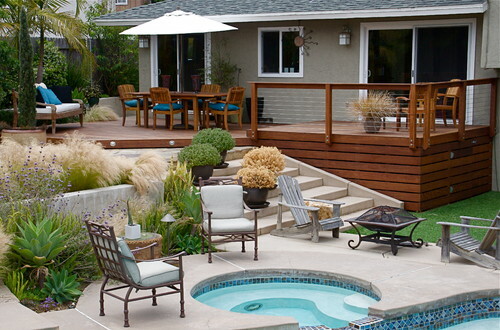 You might find that your deck and pool are so large, it takes up almost all available space for landscaping. That’s not a terrible problem to have, per se, but what can you do? You want to liven up that dead looking garden bed in the corner! Avoid anything too tall or bushy. Otherwise it will wind up looking like an unkempt area. Try subtle plants like succulents, dwarf evergreen shrubs, or clusters of annual flowers. The main goal here should be to make sure it doesn’t look like you forgot the area. 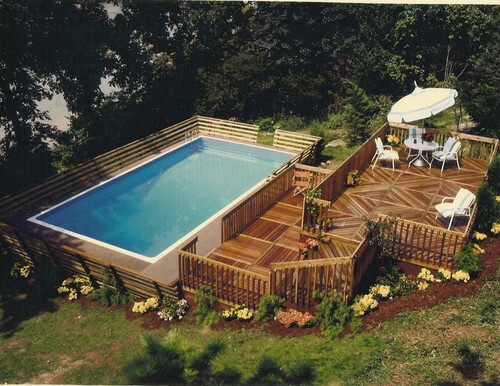 Your deck is more like a castle, a throne room that looks down on your spacious in-ground pool. The obvious focus, no matter how you try to spin it, is going to be the sheer size of your deck and pool. You can create a clear border of petunias, cedar bushes, and carnelian. 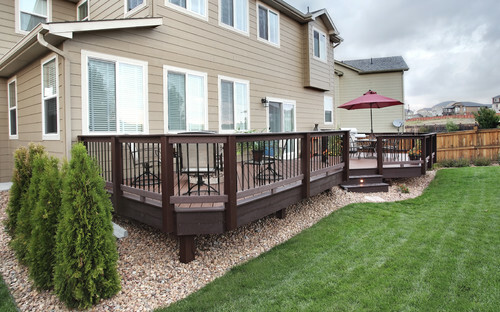 By choosing yellows and whites, you won’t run the risk of clashing with the earthy tones of your deck. 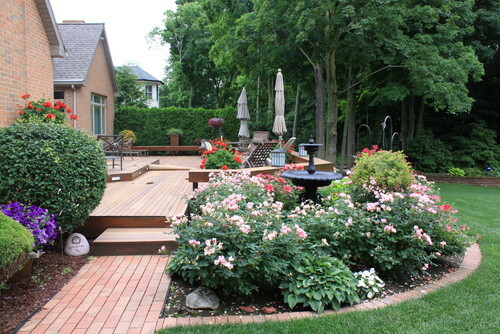 Potted impatiens on the steps of your deck break up the monotony of the wood without being too loud. Your garden’s down below and you don’t see it well when you’re lounging in your chaise. Leaving it bare makes the place look too open, but you don’t want to have to give it too much continuous attention. A few boxwood bushes planted at the back of the bed will solve most of your “gaping hole” problem. Then you can fill the forefront of the border bed with ornamental grasses. To give yourself and guests something nice to enjoy up top, hang some potted peonies overhead. You have a lot of garden bed. You have several full grown trees growing in it and still have plenty of room. You once played soccer there. Although landscaping this much space can be intimidating, try to appreciate the opportunity. You don’t have to sacrifice what you want because of constraints on space. You can have rose bushes and hydrangeas! You could even sneak in a butterfly bush! If you want a tiered look, pepper in some hostas at the front of your garden. Lavender by the stairway is never a mistake, either! You have kids or dogs…sometimes the neighbor’s dog. Whatever the case may be, these little terrors always seem to trample your flower beds. You’re tired of investing all that effort for nothing. I hear you! There’s a way to fill the space without looking lazy, so don’t panic! Get some creeping cedar on the ground and plant a few evergreens, like juniper or arborvitae. Now you have a super durable landscape design – and it stays green year round! What you want is something exotic, something that screams “different” and “bold.” But without all the drama of having to weed and prune and…ugh. Solved! Cover your entire garden bed with decorative stone filler. You can use pebbles, gravel, river stones, lava rock, or anything else. Bear in mind that the lighter the color, the more striking the effect. Stagger a few large leaf plants at irregular angles and leave plenty of space between them. Some good candidates for this could be elephant ears, bird of paradise, or giant rhubarb. You’re done! There’s too much space. You have a deck that’s high up, exposing vast garden beds below with which you have no time to do anything. What can you do with them so they don’t look so…forlorn? Sand, gravel, and shrubs. It’s almost effortless, but it doesn’t have to look that way. If you divide this massive bed space into segments, using edge stones, you can make it look like a work of art. Fill different segments with various low-maintenance filler material. Now it looks like a creative puzzle design! In a couple of the beds, plant some boxwood bushes. Done! 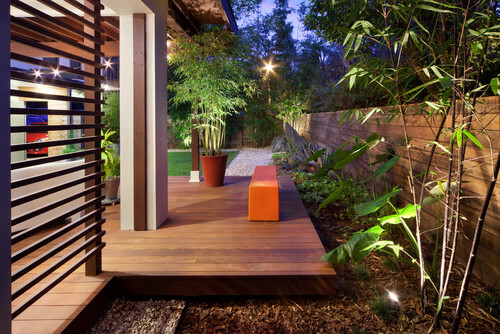 Photo by eco urban design inc.
You don’t so much have a deck as you do a wood floor with a pergola over it. You like to sit there and watch the birds and occasional chipmunk. Less is more here because you want to be able to see the nature around you. Plant a few bright colored daisies or lilies to draw in the birds or butterflies. Line the outer edges with some fescue grass. To invite birds to nest nearby, install a few ornamental trees behind your line of sight. 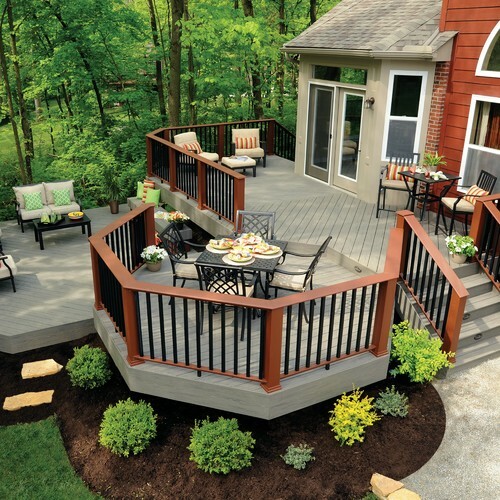 Landscaping can make or break the personality of your deck. 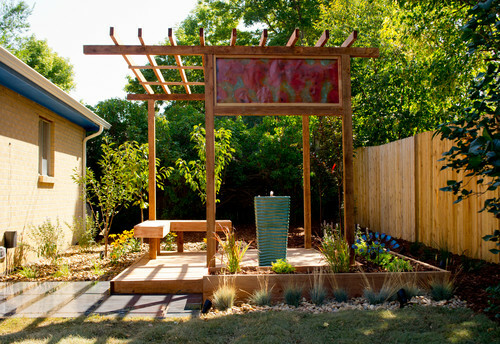 A square of wood in your backyard can transform into the sacred ground with the right landscaping. The first thing you’ll want to do is cover your entire back yard in gray gravel. Plant some blue oat grass or European beach grass around your deck. In randomized areas, plant ostrich ferns and windmill palms. You can place boston ferns in hanging baskets over the privacy fence for continuity. Don’t get too carried away – you want to maintain plenty of open space! Your deck is like walking onto a movie set of a family sitcom. It’s a couch and a floor and it’s home. To complete the image, you only need a few finishing touches to the landscape. Keep the grass as it is, since it resembles carpet, and use paver stones to mimic hallways. Don’t place anything around the border of your deck. At the edge of your yard, grow plants that remind you of houseplants. Succulents and dwarf shrubs are a safe bet. If you add larger, flowering bushes, limit it to one or two. 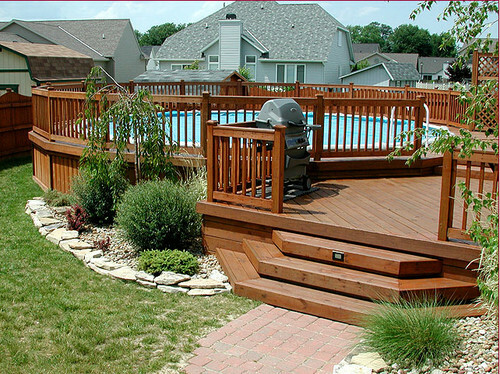 Your deck reminds you of a pier stretching out over a still body of water. You want to intensify that feeling with your landscaping, but how? First, choose a few elements that are unique to calm bodies of water, like slow-moving rivers. Take some medium sized river stones, smooth and dark and lay them atop some dark, rich mulch. Add in some zebra grass or switchgrass and you’re done! 37. All Aboard the SS Deck! 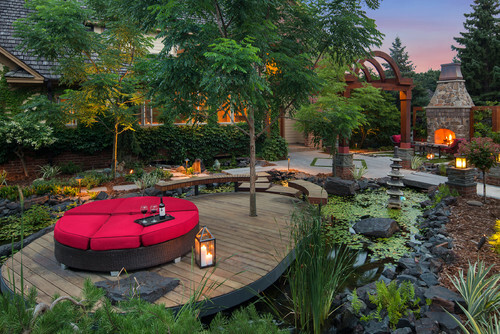 How about, instead of mulching or laying down lava rock, you build a pond around your deck? I’m serious. Dig out the area around your deck, line it with some severe looking boulders, and fill it up! 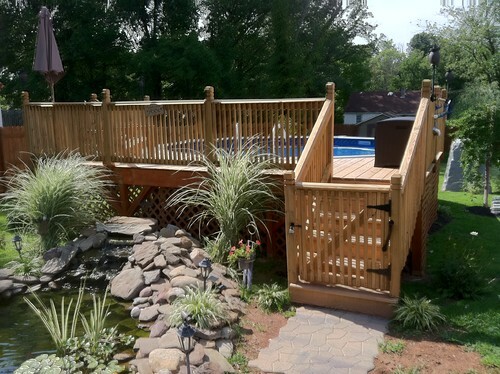 Add a few ornamental trees and ferns around the perimeter of your pond/deck and you’re finished! Did you enjoy this list? I know that when I first started looking at landscaping designs for my deck, it was overwhelming. I hope that sharing my ideas with you will save you some of the headaches. 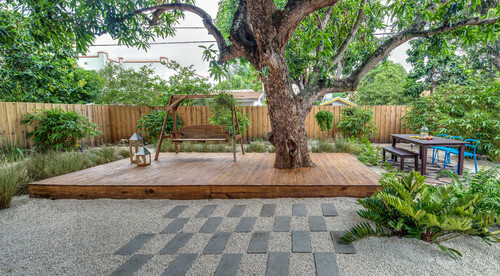 What was your favorite landscaping idea on this list? Did it help you decide what you’d like to do with your deck? Tell me what you think in the comments! And, if you liked this list, please be sure to share it!